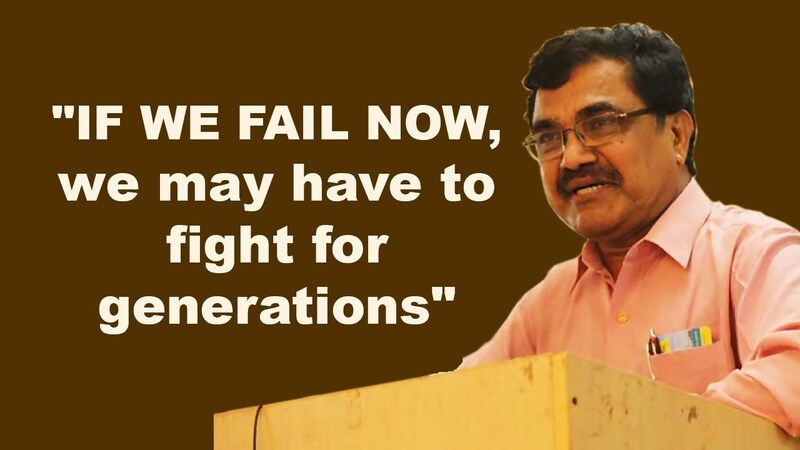 Professor Anand Teltumbde, an IIM-Ahmedabad alumnus, IIT Professor, Executive Director of BPCL, Ex-MD & CEO of Petronet India, Senior Professor and Chair, Big Data Analytics in GIM, author of 26 books, columnist in EPW, writer of innumerable articles, a noted scholar of caste-class and public policy issues, Leading Public Intellectual and Democratic and Educational Rights Activist faces imminent threat of arrest as an ‘Urban Maoist’ in the vilest post-independence plot by the state. Justice P B Sawant, retired judge of the Supreme Court and Justice B G Kolse-Patil, ex-judge of the Bombay High Court invited activists and progressive intellectuals to the Elgar Parishad on 31 December 2017 at Shaniwarwada to mobilize people against the communal and casteist policies of the NDA government led by the BJP. More than 250 organizations joined, including some Maratha organizations who had never before aligned politically with the Dalits. This alarmed the power obsessed BJP, which responded by commissioning its agent provocateurs, Milind Ekbote of Samastha Hindutva Aghadi and Sambhaji Bhide of Shiv Chhatrapati Pratishan, to create a rift between Dalits and Marathas. At the end of the conference, participants took an oath not to vote for the BJP and to protect the constitution of India. The entire conference was video-recorded by the police as well as by the organizers. Nothing untoward took place at the conference and all the delegates dispersed peacefully. On 1 January, when Dalits congregated at Bhima-Koregaon, the Hindutva goons mounted a planned attack pelting stones from the terraces of houses lining the road, beating people and burning stalls. The police merely looked on, establishing the administration’s complicity. Rumours that mischief was planned were widespread among common people, but the administration had feigned ignorance and allowed riots to happen. WhatsApp messages showed saffron flag bearers shouting slogans in the name of Ekbote and Bhide chasing and beating the Dalits who were caught unawares. On 8 January, one Tushar Damgade, an RSS functionary and a disciple of Sambhaji Bhide, filed an FIR naming Kabir Kala Manch activists for organizing the Elgar Parishad, claiming that inflammatory speeches caused the violence on 1 January. Nine days after the conference, the police began working according to this scripted plan. They raided houses of specific people and insinuated that Maoists had funded and organized the Parishad, ignoring the public statements by Justice Kolshe-Patil and in the chargesheet attached a statement attributed to Justice Sawant, which he has publicly denied.